Complete with 2 rail quick 128, pro1, pro 3 bike blocks and rack holder. 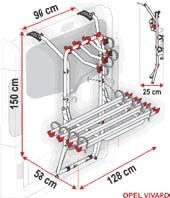 Can be adjusted to carry a maximum of 4 bikes by adding 2 rail quick 128 and a pro 2 and pro 4 bike block. 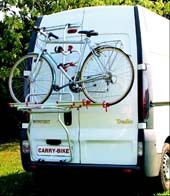 Bike carrier specially made for Mercedes Viano and Mercedes Vito after 2004 with single rear door. 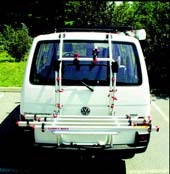 Easy installation with the standard delivered brackets, without drilling the vehicle. Supplied with: 1 lighting board wired to 13 pin plug, 2 Rail Blocks (Pro 1 and 3), 2 Rail Quick Black, 1 Rack Holder and 1 Security Strip. * Rail Quick Black and Bike block Pro Black 2 can be added to this to make it suitable for 3 bikes. Complete with 2 rail quick 128, pro 1, 3 bike blocks and rack holder. 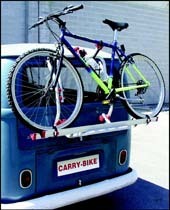 Can be adjusted to carry a maximum of 3 bikes. 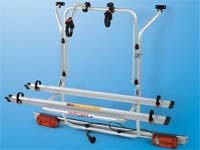 Bike carrier specially designed for Volkswagen T5 with single rear door. 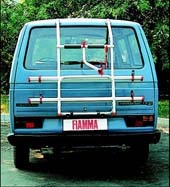 Easy installation with the standard delivered brackets, without drilling the vehicle. 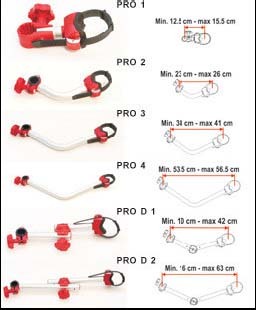 Supplied with: 2 Rail Quick Red, 1 Bike-Block Pro 1 and 3 Red, 1 Rack Holder and Security Strip. Optional: Rail Quick Red and Bike-Block Pro 2 can be added for a third bike. Optional: 2 x Rail Quick Red, Bike-Block Pro 2 and Bike-Block Pro 4 can be added for four bikes. 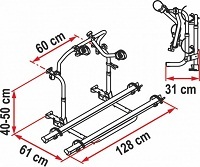 *Rail Quick 128, Bike block Pro 2 can be added to make it suitable for 3 bikes. 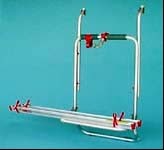 Supplied with: 2 Rail Premium, 1 Bike-Block Pro 1 and 2 Red, 1 Rack Holder and Security Strip. Complete with pro 1, pro 2 bike blocks, 2 rail strip C.
*Rail Quick 128 and Bike block Pro 2 can be added to this to make it suitable for 3 bikes. * 2 x Rail Quick 128, Bike block Pro 2 and Bike block Pro 4 can be added to this to make it suitable for 4 bikes. 2 Rail Quick Red, 1 Bike-Block Pro 1 and 3 Red, 2 Rack Holder. Suitable for: Ford Transit after 2000. Complete with 2 rail quick 128, pro 1, pro 3 bike blocks and rack holder. Complete with 2 rail quick C 128, pro 1, pro 2 bike blocks and rack holder. 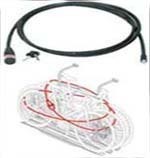 Fits Fiat Ducato, Citreon C25 (pre-1999), Ford Transit, VW LT, Peugot Boxer. All models with double doors. Complete with pro 1, pro 2 bike blocks, 2 rail strip C and rack holder. Handy anti-theft cable made of black plastic coated steel with incorporated padlock. Supplied with 2 keys. Length 250cm.